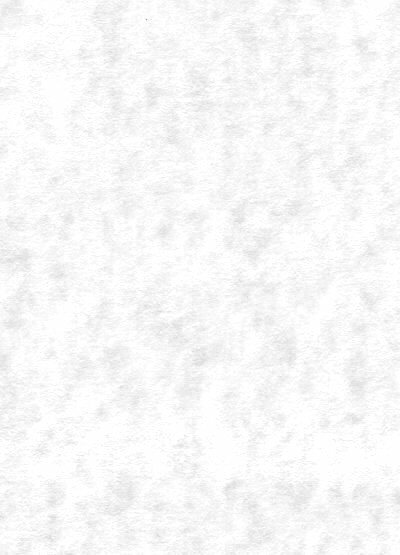 This is a visual and audible aid to help in a meditation technique called the unified practice devised by Sogyal Rinpoche  (for info about SR and for 'what meditation really is' see link below for 'Rigpa'). The device is a small box ca. 9cm x 4cm box with an ON / OFF switch (bottom right) and 'bleep' ON / OFF (switch top right). 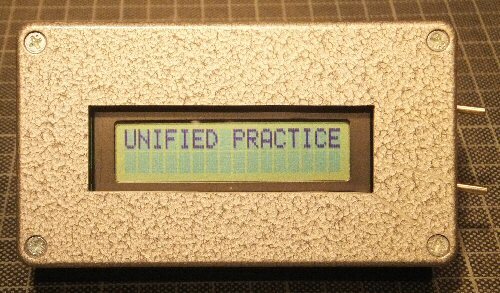 Turning it ON produces "UNIFIED PRACTICE" on the LCD screen, the device then goes into the first of the three stages of the practice. The three stages take about 10 mins, so about 3 1/3 mins for each stage. The LCD screen tells you the stage of the practice and there is a bar graph of stars that grows to show progress (* ... ** ... *** ... **** etc., see photos). 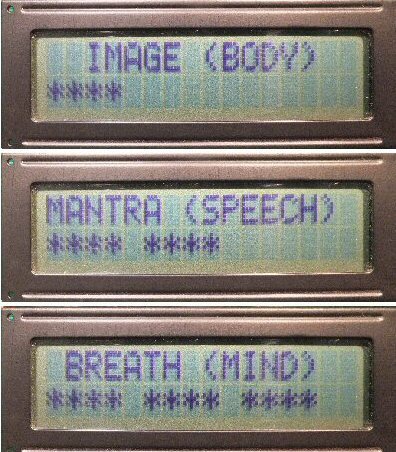 A short 'bleep' sounds at the start of each of the three stages so you dont have to 'clock-watch' the display. The display is used to remind the meditator (who might have become distracted!) to come back to the (correct place in the) practice. 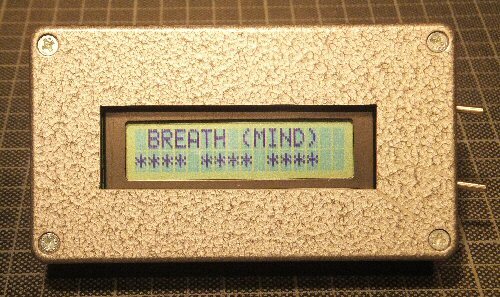 The device consists of a assembly code programmed PIC16F84 which drives an LCD display. The circuit takes only a few mA and runs on a tiny 6V battery. The Tibetan Book of Living and Dying, Sogyal Rinpoche, 2002, ISBN 0 7126 1569 5, e.g. see page 73 in the 10th Anniversary Edition.